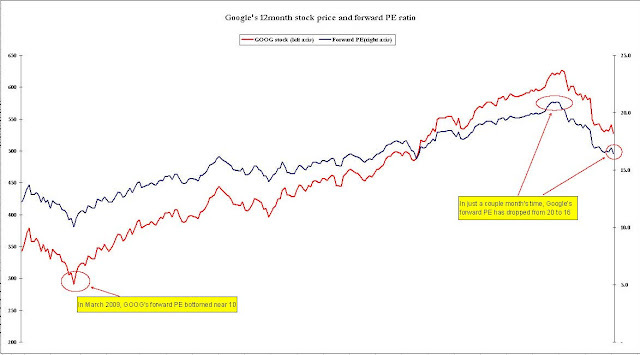 In just 25 trading days, Google's (GOOG) forward PE has dropped from 21 to 16.4, for three reasons. 1. The December quarter increased cash and equivalents per share from $69 to $77, and this is netted out when calculating the PE (Price to Earnings Ratio). Rather, it should be netted out - to each their own. 2. The forward EPS number for 2010 has increased a couple dollars. 3. The stock is off about $100 in one month. SO - is a 16 PE fair for this stock? Earnings are not exploding anymore, but will grow 18% this year and about 14-15% next year. Google may have serious tricks up it's sleeve in the future though, as it attacks the operating system monopoly, as well as the mobile phone business model. For an iconic brand like this, I think it's a bargain.